Få ditt hjärta att pumpa under detta 4-timmars mountainbike-eventyr på Red Rock Canyon längs Mustang Trail från Las Vegas Strip. Cykla dig igenom 7 till 12 miles (11,2 till 19km) underbara canyon landskap, rida längs med ditt val av 3 fullfjädring cyklar, inklusive en Specialized Stumpjumper, Santa Cruz Hightower eller Specialized Stumpjumper FSR Comp Carbon. Din resa inkluderar en guide, all nödvändig utrustning, vatten på flaska och rundturstransport från valda hotell på Las Vegas Strip. För äventyrsentusiaster får du den här gången av de asfalterade vägarna i Red Rock Canyon. 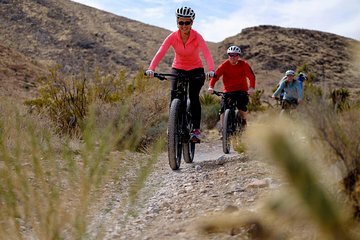 Lägg till lite utomhusaktivitet till ditt Las Vegas besök med denna mountainbike-resa till den närliggande Red Rock Canyon. Denna äventyrsspelplats är bara några minuter från Las Vegas men lyckas ändå erbjuda en mängd toppklassiga spår för mountainbikeälskare. Starta din resa vid 8:00 eller 13:00 (beroende på det valda resealternativet), från antingen New York New York, The Mirage eller Red Rock Resort. Observera att du måste lämna från en av dessa tre platser för hotellhämtning. Börja sedan din korta bilresa ut till det här skarpa, men vackra nationella bevarandeområdet för att börja din tur. Rem på din medföljande hjälm, ta tag i det medföljande flaskvattnet och klättra ombord på ditt val av cykel, välj bland en Specialized Stumpjumper, Santa Cruz Hightower eller Specialized Stumpjumper FSR Comp Carbon. Sedan åker du ut på spåret med din guide, som rider regelbundet i området och kan ge insikt i sevärdheter och spårtips under din resa. Cykla längs Mustang Trail, en enkelspårig väg som erbjuder en bra introduktion till mountainbike i området. Börja med en 1,6 kilometer lång stigning, följt av 2 mil (3.22km) sluttning till foten av Black Velvet. Ridets snabba takt, med relativt lätta stigningar, säkerställer en tur som är perfekt för äventyrliga nybörjare. Mer experter kan också förlänga sin spårresa med längre sektioner för att öka svårigheten. Total avstånd är mellan 7 och 12 miles (11 till 19km). Viktigt: Vänligen ange varje ryttarens höjd i fältet speciella krav vid utcheckning. Det finns möjlighet att din bokning inte kommer att bekräftas utan denna information. My wife and I were the only people on the morning tour. Irving arrived on time, got us quickly out to the site, got our bikes adjusted and we were on the trail. This was the first time we had used mountain bikes and it was initially a bit challenging. Irving was extremely patient and offered helpful riding tips. We quickly gained confidence and finished strong. One of the best vacation activities in recent memory. I had a blast mountain biking on the mustang trail in the red rock canyons. This will be another thing I will go back to if im in vegas. Viator is helpful site to find outdoors activities. Irving was AWESOME! We were very inexperienced mountain bike riders and he took the time to make sure we understood how the bike worked, areas of the trail to be careful on, and did it in a way that didn't make it feel like hand-holding. There was also a more experienced rider and he took them on a more challenging path. We were in Vegas for three days and this was by far my favorite activity we did. The views were wonderful and the experience is totally worth the price. Great views, excellent guide, fun group and easy logistics. Anyone looking for a little adventure off the strip will enjoy this biking trip. Irvin was our guide and he did a thorough job explaining the terrain we would be riding. I knew we were in good hands when he told us that this was his backyard growing up. He gave those that were better riders the option to take a more technical trail that would meet up with us further down the trail. I paid the extra money for a hi-end mountain bike which was worth the extra 30 dollars. The terrain was perfect, not so technical that I had to walk more than ride. Mustang trail in Red Rock Canyon is beautiful, and we stopped enough times to take pictures along the way. Next time I will be sure to pack a warm beanie, my ears were cold. 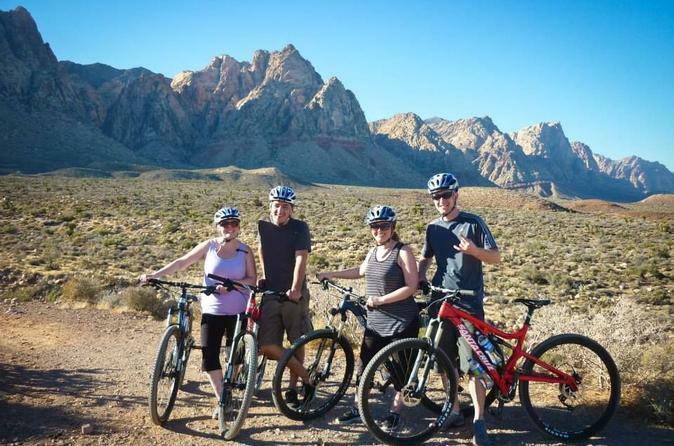 My husband and I had a great experience on the Guided Mountain Bike Tour of Mustang Trail at Red Rock. Our guide Irving was great keeping the group together and informed through the whole tour with lots of breaks to catch our breaths!. The bikes were great and easy to use. The trails were a combo of rocky skinny paths and wider less rocky paths. There was also a pretty even uphill and downhill ratio. The views were spectacular and we had the best weather with blues skies with temps in the low 70's. This tour is definitely for someone used to riding a bike, but besides that, with some good common sense and a little bit of thought about your gears, most could do this. Irving picked us up at our hotel with the bikes and helmets and had plenty of water for everyone. My husband and I came to Las Vegas for a weekend and wanted to explore outside the strip and this was an added surprise that was a highlight. For reference, we are in our 50's and are active exercisers who work out multiple times a week. A friend and wanted to stretch our legs out in the hills the day after running the LV R and R Marathon. We hooked up with Irving, our guide for the Red Rock MTB tour. Since we were the only two riders that day we were given a choice of trails from beginner to advanced. We choose something in between. The TB bikes were fill suspension and relatively new and maintained. Seats were adjustable and bike comfortable to ride. Since we did not have clip in bike shoes we had to use the flat peddles which takes away from some of the riding skills on the trail. Soon realized after riding the starting uphill trail that we were not fully used to this type of single track riding. we had the strength but not developed skills to ride sandy,rocky single track efficiently. We choose a lesser loop trail that was easier. After a while we started to adjust to the trail riding and I started to speed up and have fun. I done much MTB riding in the past so, it was starting to sink in again. My friend had very little but was adjusting. The tour level we wee on is not for the beginner MTB cyclist. Does require some skill in riding sandy, rocky single track without falling. Irving was very helpful and patient guide and adjusted to our level of riding. The trail and background mountains were colorful and quiet, a reprieve from the noisy urban scene back along the Strip. Started out warm but cooled off later in the day. Was having to much fun to notice that my arms and legs were becoming scratch up. Was wearing Tri shorts and sleeveless jersey. Needed more protection offered from a long sleeve shirt and pants that protected lower legs. My fiend fell a couple of times a received some bruising but Irving was there to help her through it all. Just as I was getting into trail the trip was over. Would like to come back next time a little more prepared to take longer more difficult trails that getting me closer to the mountains. I would recommend this tour and outfit. to all that have some MTB skill on single track. This was a great way to spend some time seeing a different side to Vegas. The tour was a lot of fun. We had Mike as a tour guide who was extremely helpful. He offered great tips on how to ride the bicycles and the trail which made it more enjoyable for our group of 3 who had never mountain biked on terrain like this. He made it challenging for us but not too challenging that we felt overwhelmed. The bicycles themselves were excellent. I would highly recommen this tour. This is a tough ride. My husband and I are experienced riders on hybrid bikes. This is not like that at all. If you don't have mountain bike experience on bikes with serious shocks this tour is not for you. The ascent is on a single track with headsize boulders. We had to walk up that. The shocks made it difficult to maintain balance on a bike with so much flexibility. I fell twice with a serious fall backwards into a river valley. Thank goodness for helmets. On the plus side the guide was great and stayed with us and was very helpful navigating the terrain. If you are a mountain biker this is a great trip. Beautiful views and amazing variety in the terrain I'd do it again but would train for about 100 hours before going!